Collin Hansen: When you’re starting off in ministry, there’s a simple question of how do you discern your call. How do you discern your call to ministry? You might have, as a young person, been confident in your communication. You might have demonstrated a facility for being able to lead and to influence others. You may enjoy talking about God and all of those most important life-changing eternal ideas. When you think about it this way, who wouldn’t want to be a pastor? Who wouldn’t want to serve in a church ministry? Who doesn’t enjoy helping others or at least being appreciated by others as you’re helping them? Who doesn’t appreciate being seen by others as wise, Godly, indispensable? The challenge here, though, is that this way of discerning our call to ministry can be self-centered on how we feel about the ministry and what’s happening through us. And then ministry becomes not so much about laying down our lives for Christ and others so much as a form of self-actualization, the discovering within of who we were meant to be and finding our purpose in the world. You see here then very clearly that in serving a ministry, we are under-shepherds to the good shepherd, Jesus Christ, whose mind belongs to us through the spirit. We have the same attitude because of our salvation. We are servants then emptied for the sake of others so that in our emptying, for their sake, they will see the exalted Christ and glorify the Father who sent Him. This message comes not only from the Apostle Paul but can also be seen then from the Apostle Peter. It’s not only for full-time vocational ministers. Certainly, it is not for less than those pastors. But if we are to lead our people, we are going to lead them in suffering. We will lead them in suffering. We can continue through this in James 1:2, where he tells us to count it all joy, all of these various trials, joy, because the testing of our faith produces steadfastness. Is that not the theme of this entire conference? Is that not then the theme of what we’re trying to look at today, the kind of suffering that will…the kind of testing of our faith that will produce steadfastness so that we can endure for a lifetime in ministry? He continues, “Blessed are you when others revile you and persecute you and utter all kinds of evil against you falsely on my account, rejoice and be glad for your reward is great in heaven, for so they persecuted the prophets who were before you.” Whether we see it or not, this message is consistent across the entire canon of Scripture. Our job description then as pastors is that as we follow Jesus, we help prepare other Christians for eternity through these many trials. We prepare them to suffer as Jesus did and for His sake so that they and we might enjoy a great reward in heaven, namely, the presence of Christ himself. In ministry then, whether you’re the full-time preacher or you’re training for it, training in some kind of other capacity of leadership, we’re often at the head of the line when it comes to the suffering and the joy, a suffering in the joy. You’ve had that experience of the juxtaposition of visiting somebody in the hospital with a newborn baby and turning right around and conducting a funeral. That’s our life in ministry. We must be prepared then to suffer well so that we might run the race marked out for us in joy as we read about in Hebrews 12:1. So, let’s look then at seven steps to be able to endure for a lifetime in ministry. First step then is to pad your resume with your weaknesses. First step, pad your resume with your weaknesses. Let’s consider here the typical pastoral search committee kind of perspective, is what they’re looking for. Evangelize like Billy Graham, think like Tim Keller, counsel like Larry Crabb, bonus if you can sing like Kirk Franklin. All right. So that’s typically what you see in there, much experience required. This can be a difficult experience for us, confusing when we’re trying to explain or sell ourselves in the market, in the ministry market. How do you boast about your ministry? What do you put on your resume? The number of baptisms that you have conducted? The number of people you’ve led to Christ, how your church has grown, how much offering is given, and exactly what metrics are you supposed to use here to be able to show your success? So, let’s look. Why then? Why does the Apostle Paul boast in his weakness? Why is that the resume he offers here to the Corinthians? He wants them to see that the power of God is more evident than his own strengths. And we know that Paul, he’s not…he’s telling the truth here about what he has done but you don’t see any hint here of this man being among the most learned of his entire generation, of having trained with the most famous rabbi of his day, have been a man who has written what I think we can say are the most influential documents in world history inspired by the Holy Spirit. This is a man who was tremendously used by God, and yet what he boasts in, he boasts in his weakness. He wants us to see. He wanted the Corinthians to see that it is not about the individual being exalted but the same spirit at work in all believers, in all believers and not just pastors. Paul also understood something that’s very counterintuitive to the Corinthians, it’s very counterintuitive to us today. Strength is a mirage. Strength is a mirage. We’re all wasting away. We’re all wasting away, but eternity is coming. “But eternity is coming,” that’s the message he wants them to see here. So the first step to enduring ministry for a lifetime is to pad your resume with your weaknesses. Of course, so that the power of God might be evident and so that you can keep properly focused in your leadership on eternity, preparing yourself and preparing your congregation for eternity. Second thing to endure for a lifetime of ministry is to admit your plans, admit that your plans may not be God’s plans. Admit that your plans may not be God’s plans. Geneva in Switzerland is one of the most beautiful cities in the world. I hope you’ve been able to visit. If you haven’t, I hope you can seize an opportunity to do that someday. I’ve been privileged to visit there three different times. I can’t wait to be able to go back someday. It’s fascinating to me, though, that John Calvin in the 16th century had to be persuaded twice to stay, had to be persuaded twice to be able to stay. He wanted a quiet academic life. But God instead intended him to serve among the people of Geneva as a pastor. The plans God has for us are not always going to seem good to us at the time. Also, to the book this year called, “15 things Seminary Couldn’t Teach Me,” which I recount my own story of graduating from seminary not being able to find a job. That was part of the…my plans not being what God intended for me. It’s interestingly how I ended working for The Gospel Coalition. But those plans certainly did not seem to be good to me at the time. And the thing is God’s plans for us may not ever be evidently good for us, good to us in our lifetimes. They may never seem to really make sense. But Calvin offered this perspective from the Psalms, one of the greatest biblical commentators of all time and you can see why here. The Psalms will principally teach and train us to bear the cross. By doing this, we renounce the guidance of our own affections and submit ourselves entirely to God leaving Him to govern us and to dispose our life according to His will, so that the afflictions which are the bitterest and most severe to our nature becomes sweet to us because they precede from Him. Calvin was never comfortable, entirely comfortable in Geneva. He lived as an exile. He was not from Geneva. Of course, he was French, and he ministered to other exiles, others who had fled from France into Geneva. But like those elect exiles that we read about in 1 Peter, we’re all in the same position eagerly awaiting our eternal home where all will be site for us. So we must then admit that our plans may not be God’s plans even if we don’t understand them at the time and even if we never understand them. So the third step to endure for a lifetime in ministry is to look for Christ in even the dark and dismal corners, to look for Christ in even the dark and dismal corners. Corrie ten Boom is one of my heroes. She’s written one of most powerful stories. You may be familiar with her. If you’re not familiar, you can leave right now. You can go pick up a copy of “The Hiding Place” and you’ll be far greater, more edified. Corrie’s story is after helping to fight against the Nazis in Holland. And she ends up in a concentration camp hiding Jews. She ends up in a concentration camp with her sister, Betsie. And one of the most powerful stories from there is how they’re plagued by these fleas, plagued by these fleas in the concentration camp. I mean, think of all the terrible things that you’re in enduring but on top of everything else, you’ve got to deal with these fleas. Okay. It’s horrible. But there’s a famous quote that comes from there, it comes from this incident, it comes from Corrie’s sister, Betsie, when she is about to die. And she wants this message that would end up inspiring Corrie’s life, of course, and many of us for decades afterward. But she says to tell the people outside of the concentration camp, “There is no pit so deep God’s love is not deeper still.” There is no pit so deep God’s love is not deeper still, no place where Christ has not gone before us so that he can help us. We see this just consistently throughout Scripture. We see this consistently throughout Christian history. Paul wrote his letter to the Philippians from prison. John Bunyan wrote 60 books, many of them from prison, including his most famous, Pilgrim’s Progress. Indeed, among the very most read piece of literature, if not, the most read piece of literature in the English language in all of history written from prison, a man who took advantage of that time, similar to what we’ve seen from Andrew Brunson in Turkey. He took that time to just immerse himself in Scripture and had been immersed in Scripture even before heading to prison. Bunyan was in prison because he would not conform his preaching, his evangelical preaching to the standards of the state church at the time, spent 13 years in jail when he could not provide or care for his wife and his children. But God never left him. God never left him and he never leaves us likewise as we have His word written on the page and stored in our heart. And here’s the climactic quote, “I could pray for greater trouble for the greater comfort’s sake.” I could pray for greater trouble for the greater comfort’s sake. I don’t know exactly how I feel about praying that. Early in my marriage, I told my wife we needed to pray for suffering. I’ve never been forgiven of that. We have an interesting relationship. Suffering is part of a fallen world, it’s not something we eagerly look forward to, it’s not something we seek out for its own sake, and yet, it is somehow something God purposes for His own good and for His glory and for our good as well. And so, you see even here, somebody who endured far greater hardship than probably most of us in the room, yet finding Christ there in that difficulty saying, “I could pray for greater trouble for the greater comfort’s sake.” Again, you can’t always know how God is going to reveal himself. We don’t know but can be sure that nowhere is beyond His sight and nowhere is beyond His reach. Nowhere is beyond his sight, no difficulty that you endure, no suffering that [inaudible 00:18:39] is beyond His sight and His reach. So, to endure for a lifetime in ministry, we look for Christ in even the dark and dismal corners. On my fourth point, I’m afraid Kevin DeYoung stole a little bit of my thunder last night on this one. That’s okay. It’s a good point. Fourth point, we don’t give in to self-pity when rejected. You don’t give in to self-pity when you’re rejected. Almost every… She talked about this if you were at the panel last night. Almost every book I’ve written, almost every book I’ve edited has featured Jonathan Edwards, one of my heroes. Can anyone be a better role model for success in ministry than Jonathan Edwards? Just think about this for a second. His church experienced revival. In fact, it was a revival that was so famous it spread around the world. In fact, basically, that created the genre of revival literature. For years, people would come to visit his town because this town was so famous for what God had done there. He shaped the very evangelical movement that we belong to today. He’s one of those American founding fathers of evangelicalism, even including then the transatlantic dimensions of that. Public school students today still read his sermons, are still familiar with him. They may not like him but they’re still familiar with him. Yale University, of all places, when it’s not producing presidents and supreme court justices, is publishing everything he ever wrote, the complete collected Works of Jonathan Edwards. Seminaries. Plural. Plural. Seminaries name study centers after him. He’s widely regarded to be the greatest theologian in American history and even, perhaps, in the English language. He took over. He even did the right thing by family standards. He took over the same church his grandfather had pastored for 60 years. What a role model for success in ministry. Usually, people don’t talk about the fact that he got fired from that church. Usually, that part doesn’t come up. Got fired because he went against his grandfather’s more permissive policy when it comes to the Lord’s Supper. Basically, the idea was his grandfather Solomon started a thought that the Lord’s Supper should be a converting ordinance, something you administer to people to help bring them to faith. Edwards believed it was something that was a demonstration of faith, only to be partaken in by true believers who had covenanted in membership with the church. So Jonathan demanded evidence at a public profession of faith from the youth before they would come forward then for communion and seeking church membership. The town was not keen on this at all. They felt like he was changing the terms of agreement that they had come to with his grandfather and that he was judging them to be spiritually lax. Well, I mean, he was. It was part of the reality there. He was judging them to be spiritually lax. He was a revival preacher after all. The challenges you see here is that the very nature of way pastoral ministry is set up is that we’re always in danger of biting the hands that literally feed us and our families. I’m sure you’ve felt it before. It’s a difficulty that poses some significant conflicts of interest. How do you bring to bear the difficult things of God on people who are judging you with their checkbooks and they’re judging you with their feat about whether they will come or stay or not? It’s a difficult thing. It’s not new in our generation. Edwards faced it as well. It doesn’t matter how famous he was, it didn’t matter how long he had been there, how long his family had been there. They still got rid of him. He preached a remarkable farewell sermon. I mentioned this last night, never did budge from his conviction or for his spiritual responsibility for the church in the community, never did think he was wrong. I don’t think he was wrong in what he did. There, never did budge. But his love for the congregation and for his community persisted even beyond there. They couldn’t find a pastor immediately. They searched for several months afterward, looking for a replacement while he continued to serve them. I can’t imagine how awkward that must have been. Just try that in your church. Now, I’ll just…I know. We’ve had a falling out. I’ll just stay here and continue to serve and preach until you find somebody else. Well, Edwards would end up having another act to his ministry after that, that the Lord had prepared for him and were the grateful beneficiaries of. He served as a missionary to Native Americans in Stockbridge, Massachusetts, from 1751 to 1758. While he was there he published his best known work, his best read work, “The Life of David Brainerd,” his account of one of the most inspiring and difficult to understand and to follow, sometimes, missionary David Brainerd. He also wrote…many of his other most famous treatises, “The Freedom of the Will,” still read in seminary today and debated vigorously in seminaries today. “Concerning the End for Which God Created the World,” “Nature of True Virtue,” and “Original Sin,” all of that done while in missionary in Stockbridge from 1751 to 1758, after the revivals had passed and after he had been fired from his church. You will face setbacks in ministry. We all faced setbacks in ministry. You may even be fired. You may even wonder how you will care for your family. I hear from pastors all the time in that situation, but self-pity will only inhibit you from a faithful response and the subsequent service to which God has called you, which God has called you. So that’s number four, do not give in to self-pity when you’re rejected. So, number five in the steps to endure for a lifetime in ministry is to remember that opposition…goes well with Edwards. Remember that opposition does not necessarily mean that you’ve been unfaithful or that God disapproves. Opposition does not necessarily mean you’ve been unfaithful or that God disapproves of you or what you’re doing. Kevin mentioned this last night as well. We want people…oh, go ahead. Yeah. That point again, repeat it again? Yeah. Remember that opposition does not necessarily mean that you’ve been unfaithful or that God disapproves. I have to use too many negatives in there because the problem is the positive doesn’t work because it’s…I’m using kind of some Edwardian language there. Sometimes you face opposition because you are wrong. Sometimes you are in sin and you deserve the opposition. The point is simply that it doesn’t necessarily mean that you are and that’s what we’re gonna look at here. We want people to like us. That’s part of probably why a lot of us go into ministry. I started out there. We want to help people. We want people to know that we’re helping them. We want them to like us. But like we talked about last night, if you care too much about people liking, then you might not be cut out for ministry. If you care too little, you might not be cut out for ministry either. That’s what Kevin said. This can go wrong in a couple of different directions. The point here is that we simply cannot gauge the effectiveness of what we’re doing solely by how people respond. Now some of that is required. Sometimes we do have to, of course, lead in a way that people can understand and comprehend. I’m just saying that we cannot judge that effectiveness solely by that metric. But it’s pretty simple. If Jesus told us to expect persecution, to expect persecution for following him, then actually, in some cases, opposition is going to be a sign of faithfulness, a sign of faithfulness. This is where I’m tempted to bring Randy Gruendyke to come up here and to talk about Charles Simeon, one of the authors of our chapter here. Randy, just wave. Wave to everybody there. He wrote our chapter on Charles Simeon for the book “12 Faithful Men.” I’m really glad to have him here, pastor here in Southern California. This was the case with Charles Simeon. He grew up among the British elite of the mid-18th century, not that far off then from Jonathan Edwards, had experienced that evangelical awakening as a young man. I think, sometimes, we imagine that in ye olden days, things were better, everybody was pious, people were happy, they just showed up to church. That wasn’t Cambridge of the mid-1700s, the mid-18th century. And the criticism he faced back then is actually fairly similar to what we hear now. He was described as an enthusiast. This was a common descripting remark made of evangelicals at that time. It’s part of what would help them to be known as the Methodists, in some case, which was originally meant to disparage them and then later, became a badge of honor. Actually, he grew up in kind of a revival stream of Methodism, at least through my family’s history going all the way back to Wales. But it’s interesting that by the time I was growing up in the modern United Methodist church, we went to church. We knew we weren’t like those freaks who enjoyed being there. Those were the feat we could not understand, like, I get it. You show up and you just kinda put up with it and you go watch football. But those people who are excited, we do not understand. They are the enthusiasts. Religion back then as it can be for now is something that was meant to be endured and not meant necessarily to be enjoyed as part of why the writings of Jonathan Edwards to be influential this period, to help people to understand the role of the religious affections in religion. Simeon took over the famed Holy Trinity Church in Cambridge at the age of 23 in 1782, [inaudible 00:29:19] as a sign of their opposition to him, locked their pews upfront, and didn’t show up. Are you familiar with this practice of pew locking? Okay. So in these communities, you’d have people who were assigned a position, would purchase positions in the church based on their prominence and their wealth in the community. And so, if you go to Charleston, South Carolina, you can still see this today. You don’t have to venture all the way across the Atlantic. But all the most prominent people would have their pews upfront here and then there would be a lock on the end, you couldn’t get in and without that, you know, you had a family key. So assign essentially like if you think about it in a room like this, all of the pews would have been locked as forms of opposition so that everybody would have to sit or stand in the back if they couldn’t find any place to sit up front. When he took chairs and began to set them up for other people, they just took those chairs and they tossed them out the windows so people couldn’t sit down in there. At one point, when he tried to start a Sunday evening service, they just went ahead locked up the church, not to let him in. Cambridge would schedule classes opposite of his preaching so that the students couldn’t attend and listen to him. He was pelted, at one point, by rotten eggs. At one point, he had to judge, okay, it’s like a spy movie or something. He had to go at a different way knowing he was gonna get jumped if he went out the front entrance that he had come in. This reminds me so much of the suffering servant of Jesus Christ himself. He opened not his mouth in defense. He interested himself…well, this is an extraordinarily capable man and those of us who are called in ministry are often those who are comfortable and confident in being able to present ourselves and being able to make a case for ourselves and being able to defend ourselves. Therefore, we are far more susceptible than we possibly realize at points to saying things that we shouldn’t and doing things that we shouldn’t. But he understood himself and said, “I would rather suffer than to act because, at least, then I know that I can’t be in sin in that regard.” I suppose you can probably take that too far and not do what is necessary. But I think it’s a good example here of him understanding himself. He did not give up. He did not give in. And we’re so glad that he didn’t, the kinds of ministries, even going back to the church where Randy and I had both worshipped in and where we had planted, just continuing to carry on that legacy of Simeon’s with the Simeon Trust and Holy Trinity Church and all kinds of different things. But his ministry also helped to spawn the Universities and Colleges Christian Fellowship, the leading collegiate ministry in the UK, which is also then closely related to help starting Intervarsity Christian fellowship here in the United States. And then, globally, the International Fellowship of Evangelical Students. We’re so grateful that he did not take this opposition as a sign that he was doing something wrong and therefore, change course from his biblical Evangelical convictions. I wanna dwell a little bit longer on this point because I wanna share a little bit about another figure that you’re probably not familiar with. We write about him as well in “12 Faithful Men.” You’ve probably not heard of Janani Luwum, but in this fallen world, you’ve probably heard of the man who killed him, Idi Amin. You’ve probably heard of Idi Amin. There’s lots of talk…you hear lots of talk these days about being on the right side of history. It boggles my mind because in a fallen evil world, how can you possibly judge what side of history you’re on based on who’s in power at the time or what’s popular or what’s trending in a certain direction? Because Idi Amin seems like he was on the right side of history. He is the one who is in power. He is the one who had the ability to be able to kill everybody in Uganda. He was on the right side of history, the man with the gun there. And with that power, Luwum, was just the archbishop of the Anglican church in Uganda until his death in 1977. Without the view of eternity, he would appear to have been on the wrong side of history, but he could, by his convictions, his faith in God, he could speak up against one of the world’s most murderous dictators, because he knew. He knew of God’s approval of him in Christ. It’s like Luwum saw himself as part of a long series of Christians who had learned to endure in ministry, and to suffer well for the sake of our suffering servant, Jesus Christ. It’s like Justin Martyr, the apologist, said in the second century. “You can kill us, but you cannot hurt us.” You can kill us, but you cannot hurt us because history is eternal and history is ruled by Jesus, so we fear and we bow to no man who opposes Jesus. As Luwum said before his death, God and God alone is my witness. God is my witness. So that is point five in the seven steps to endure for a lifetime in ministry, to remember that opposition does not necessarily mean even unfaithful or that God disapproves. It wasn’t the case of the opposition that Jesus faced, it wasn’t the case of the opposition that Paul faced, and it wasn’t in the case of the opposition faced by Simeon or by Luwum. So, six, two more points here. Number six, we endure in ministry as we wait for God, especially. You wait for God, especially, if you don’t know where he is. You wait for God, especially, if you don’t know where he is. This book was motivated in part by what we had seen and reported on at The Gospel Coalition about the rates of pastoral suicides. A number of pastors committing suicide has increased 24% between 1999 and 2014. Interviewed a number of different experts to try to understand why. It was hard to know. Of course, it’s a lot of pressure, a lot of pressure in this work. It’s not new, though. We’ve been looking at Luwum. We’ve been looking at Simeon and Edwards. That’s actually not really new in ministry. I do actually think that some of the stigmas related to depression that we endure sometimes have lessened, medicine to help us in clinical depression is more widely available. So, it’s not exactly sure why in all these cases. But we do know that in ministry, we are particularly prone to being weighed down by sorrow, the sorrows of ourselves, of our families, of all of those that we know and love in the church, even those who have left us and gone out from us like we see from Paul talking about there. We’re worried, I think. I think there’s a stigma. We’re worried about when we share about the difficulties that we face. We’re worried about adding to the burdens of others and I think we’re afraid of some of the…by letting them down, just letting them down because we’re in that position of strength of spiritual sustenance for them. And I think in that isolation, this shame can then begin to overwhelm us. And that’s what leads people to contemplate these horrible decisions, these terrifying decisions to commit suicide. Well, there may be no more successful, I suppose, it would be maybe a competition between Jonathan Edwards and Charles Spurgeon. No more successful pastor, I think, probably than Charles Spurgeon, the first-ever megachurch pastor that we know of. Probably, at least, nobody is quoted more often today, especially by pastors, I think, than the Prince of Preachers. And yet, Spurgeon suffered from what he variously called his personal struggles, his fainting fits or his spiritual sorrows. It strikes me that Edwards himself was also prone to melancholy. I don’t think we quite exactly understand what that meant but it might have had some elements of depression in it. It’s pretty remarkable in the case of Spurgeon that he openly admitted, openly admitted in his church these feelings of despair and discouragement. It really started early on in his ministry. He never really recovered from it. There was an incident on October 19 of 1856, Spurgeon, there were a few elements there of Simeon’s case from a hundred years earlier or at least the century earlier, that it wasn’t necessarily popular in Victorian England to be the seven-joker preacher. I mean he was a celebrity. But still, there were plenty of people who opposed Christ and opposed the Gospel and opposed Spurgeon. There was a troublemaker in his congregation who shouted “fire” in a crowded church as he was preaching. I think it’s hard for us to understand just the terror that would grip when we deal with, and especially in this area, the forest fires and things like that. But just the immediate threat of how quickly these fires would spread, it led to a stampede with thousands of people. Seven people died, 28 people were seriously injured. Think about this, I mean, this church is large enough to have thousands of people to attract negative attention, by this point, for somebody to shout, “fire.” Spurgeon was 22 years old at the time, 22 years old. Furthermore, he had been married 10 months earlier. This was his first month with his twin boys, and the critics of what happened with the stampede blamed Spurgeon. They blamed him for this. Things were so difficult that Charles wife, Susannah, thought that he might be going insane. “Oh, Spirit of God, magnify thy strength in thy servant’s weakness, and enable him to honor his Lord, even when his soul is cast down within him.” The chapter on Spurgeon in our book is written by Zack Eswine, who has written some absolutely essential works on the nature in pastoral ministry including the life of Spurgeon there. Spurgeon still 25 years later was suffering from post-traumatic stress disorder during a large gathering of the Baptist Union, he endured a panic attack there. You know, in these situations sometimes a change in circumstances can help, sometimes a different ministry position. It’s hard to know exactly what to do. Sometimes diet and exercise can help. Again, maybe moving to a different position. Sometimes medicine can be a bridge toward a more healthy norm. I think one thing we must absolutely keep in mind, we just don’t know where God is when those sorrows overwhelm us, is to not make decisions and to not make statements that we can’t take back. In other words, don’t trust anything you think on a Monday morning. Don’t trust yourself in those times. God is there. God is there whether you see him or sense him or not. He speaks to us through His word. He hears us even if all we can do is groan at the time. He hears us. Jesus is the head of the body of Christ, His church, and I think it’s those [inaudible 00:43:27] we feast on the body and blood of Christ in the Lord’s Supper that…where we seek that nourishment, that sign that remembrance for us that Christ is with us whether or not we sense it. We are certain. We are sure to be discouraged. Some of us, again, are gonna be prone to depression and melancholy as Edwards and Spurgeon were. Again, I think the eternal perspective is key because we know. We live in a fallen world with sin and its effects that afflict our bodies, they afflict our minds, and the waiting on God in these moments can be indefinite. I mean, we just don’t know where they’re going to end, where those clouds are going to lift when God will make himself more palpable to us again. But the only circumstance, only scenario that makes suffering ultimately bearable and why Paul could call it light and momentary, is the final redemption of all things by Jesus Christ. If He’s not resurrected, then we don’t have hope. But if He is, then we have all the hope we could ever need, that is objectively true at all times and in all places no matter how we feel. Last point then after we wait for God, especially if we don’t know where he is. We do the right thing. We do the right thing even if we think we’re too late. You do the right thing even if you think it’s too late. That’s the last point of how we endure in ministry. I wonder, who are the real heroes from the vantage point of heaven? Who are the real heroes from that vantage point? And I wonder how things are gonna look to us when [inaudible 00:45:16] and the last are first? Wang Ming-Dao is not well known in the West, but he’s been called the Dean of the House Churches in China. His ministry started in 1923. He was very similar to many other pioneering leaders. He was known for his uncompromising convictions and behavior. He did not suffer fools. He expected criticism and persecution. That was part of the package. That’s good because not only is it biblical, as we’ve been looking at, but also because he ministered in 20th century China where Christianity would conflict with communism. And not just communism, he also lived under Japanese occupation. Wang was not interested, though, in comfort or fame, which made him just the kind of leader to help direct dynamic Chinese churches. There’s a common theme that endures to this day of an effort from the Chinese government to be able to control churches. You actually see this very recently with Pope Francis’ decision to recognize the bishop selected by the government there. I think a fairly devastating decision. But this was also a similar issue going all the way back to Japanese occupation of China during World War II. Now, Wang resisted this Japanese influence. Essentially, what they’re asking the pastors to do was to help support the Japanese cause or at least not to oppose that cause. This again we continue through the communists under Mao. And Wang rejected [inaudible 00:47:03] Three-Self Patriotic Church. There was an official…recognized as there is to this day, an official recognized Chinese state church. But he resisted them mainly, actually, on theological grounds. They were liberals. The Three-Self Patriotic Church did not believe in the creation, the virgin birth, vicarious atonement, bodily resurrection, the physical return of Jesus. There were some serious problems with the state church. So he ended up harassed by the communist government from 1951 to 1955 and was arrested on August 7 of 1955 after a particularly stinging critique of the Three-Self Liberals. He was actually released after a year, but on one condition. He had to confess to crimes that he didn’t commit. He had to confess to crimes he didn’t commit. His situation was impossible, it actually reminds you a lot of John Bunyan’s. He didn’t think his wife, who was arrested with him, or the other church leaders that were arrested with him, could survive in prison. So he felt an obligation to get them out. So he fessed up to crimes that he didn’t commit. But on the outside, he couldn’t join the state church, couldn’t bring himself to do that, and ultimately, he couldn’t live with his decision, he couldn’t live with his decision to recant and to confess those crimes he didn’t commit. So, he went back to jail, 1957, and he didn’t get out until 1979, ’57 to 1979. His wife was released in 1974. He had to come back, actually, and to seek forgiveness for recanting his views on the state church and the government. It wasn’t too late for him. For those of you who are familiar with your early church history, this is an issue that came up often of people who under threat of persecution and martyrdom would often recant their Christian faith but then, would think better of it and seek to come back to the church. And there were serious debates about whether or not they should be readmitted in those cases. Wang never recanted his faith. Like I said, he was talking, he was confessing to his crimes that he didn’t commit. But the point here is to say it wasn’t too late for him to do the right thing, it was not too late for him to do the right thing. The government had sought to rob his family and himself of his life and his ministry, but they failed. They failed. The house church has thrived even still under increasing pressure to this day. He would become an international figure in some ways. Billy Graham and other Christian ambassadors would support him. And we do continue to remember him now, not only as a man of uncommon conviction. Sometimes, those leaders, I don’t know how they are with you but sometimes they can intimidate me and make me feel like I just don’t measure up to their standards. So, sometimes, these stories can actually humanize them whereas we can relate to. Because like us, he was a recipient of the same grace of God, even in his weakness and his failure to live up to his ideals. So, in conclusion, we remember all of these figures. We remember all of these figures as heroes, the kinds of people that we’d like to imitate, even though we don’t wish their circumstances upon us. Maybe even somebody in this room will be remembered someday in conference workshop like this. But the point is this, we have to remember what made them great. We must remember what made them great. Yes, they had, in many cases, a God-given genius. I can read as much as Jonathan Edwards as I want and I’ll never come close to being able to understand everything that he’s saying there. Yes, there was a God-given genius, a hard work, a determination. But what is surely common to all leaders used by God is a willingness to faithfully endure hardship as a God-appointed means for our sanctification and even his purposes beyond the horizon of our understanding. We’re not above suffering. We’re not above suffering because we’re not above Jesus. And what we learned from Jesus is that He learned obedience through what He suffered. In Hebrews 5:8, “And he did so for the joy, for the joy set before him.” From Hebrews 12:12, “Namely, the joy set before him of His eternal exaltation which we will participate in.” Think about that. Think about what that’s going to be like. That’s why the temptations and trials are light and momentary. Now, if we truly believe that eternity is coming. So, as Ministers of the Gospel, we show that we do not live by bread alone but by every word that comes from the mouth of God, as Jesus himself quoted in Matthew 4:4, from Deuteronomy 8:3, we follow Christ and we bid others to follow us and find abundant life in Christ. So, the key to enduring for a lifetime in ministry is to remember that we live for God and we live for eternity. Thank you. 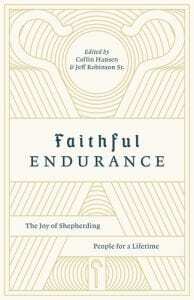 New from TGC: Faithful Endurance: The Joy of Shepherding People for a Lifetime, a book of practical wisdom from veteran pastors for real-life issues. Edited by Collin Hansen and Jeff Robinson with chapters by Tim Keller, Bryan Chapell, Dave Harvey, and more. Preorder your copy today!